is one of the best models to make a statement in a bedroom. Designed in quality bonded leather and featuring time relevant low standing design, the piece is one of the best additions to any modern bedroom. Topped by a perfectly round shape that really makes a statement in your bedroom interior, this model will change the way a bedroom looks. At the same time, circular Romantica bed features a truly timeless, Chesterfield headrest design and a classic, interior neutral white colour. This astonishing blend of latest interior trends and some classic, truly timeless decoration approaches in one of the first things that make circular Romantic bed in white bonded leather so special. Finest quality upholstery material is one hundred percent natural, which accounts for high durability of the piece. Fabulous mix of white bonded leather and shiny diamante inserts in the headrest and the body of the piece give any bedroom a look that is luxurious and unobtrusive at the same time. 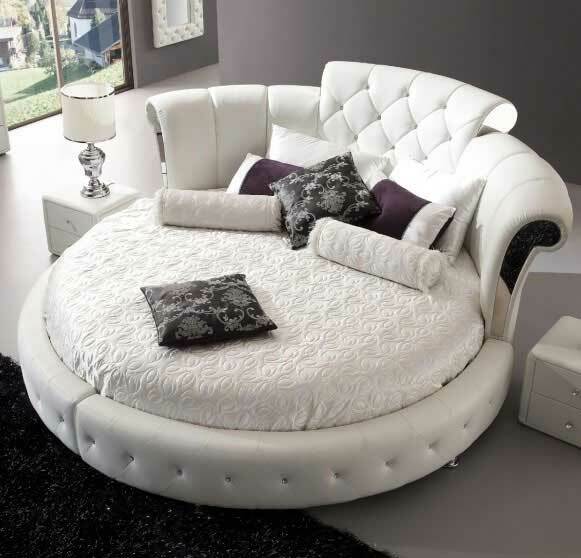 , perfectly round shape of the Romantica white bed in bonded leather is welcoming you to plunge into the world of dreams and forget about your daily troubles. The piece is amazing to lie in, as well as to sit onto, offering you a great, practical decoration solution for any bedroom interior. Yet, one of the best things about circular Romantica white bed to make a statement in your bedroom is a classic upholstery material and an amazing, classic shade. White bed can easily fit into an all-white bedroom — just as it can become a fabulous addition to any other dominant shade. It is easy to contrast circular Romantica white bed to make a statement — any furniture, wall shades, as well as minor accessories can serve as stylish contrasting means. White is truly one of a kind hue that can be combined with an entire colour palette. Despite its low standing design, there is enough space between the floor and the mattress for the latter one to breathe. Combined with an incredibly durable frame construction, this feature ensures a very long life span of the furniture piece. Plus, truly timeless bonded leather upholstery, as one of the most durable upholstery types in the furniture market, ensures that circular Romantica white bed stays in your bedroom forever. Moreover, this astonishing piece comes with a circular mattress included in the end price of the bed. Given its amazing durability and a design that truly makes a statement in your bedroom, Romantica bed is available at a highly reasonable cost — just £1,999.95. And the best thing is — you can make your bedroom even more impressive by adding a couple of matching Romantica bedside cabinets or a chaise (available separately).